Located on Charing Cross Road, Lotus is an authentic fine dining Indian restaurant and one of theatreland’s best kept secrets. Named for the national flower of India, Lotus marries tradition with innovation to present a superb gourmet experience. Chef Patron Bhaskar Banerjee, who has over two decades of experience, has created a collection of signature dishes, which combine traditional cooking techniques with imported Indian spices and fresh locally-sourced meat, fish and game including British roe deer and the famous Queenie scallops from the Isle of Man. You know when you eat food and it makes you want to cry because it’s so good? Well that was my entire night at Lotus! From the gorgeous Rasam soup (which tasted like hot chilli con carne), to the starters of Corn Chaat Golgappa and Rattes, Chickpea, Sev and Yogurt Chatt. The Lamb Chops and Rump with Garlic Pickle, Indian Onion and Chilli Salad was literally to die for. 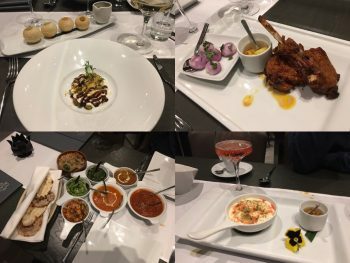 For mains we had a selection of Chicken Bemisaal, Muntjac Lal Maas and a selection of side dishes include a beautiful Indian bread basket. I couldn’t stop there and had to try the Milk Dumpling for desert which was divine. I am salivating at the thought of all of this right now! The staff are exceptionally friendly and know everything there is to know about the menu. They can also recommend a different wine for each course depending on what you order. This can make things a bit pricey but if you want to go all out and have a real treat then let them pair a wine with each of your courses. Lotus isn’t the kind of restaurant you would go to for a Vinderloo and a Beer. It is a different side to Indian dining is an incredible treat. They offer a brilliant Theatre Menu which is a steal at just 23.99 per person for three courses. The Theatre Menu is offered between 17:00 – 18:00 and 21:30- 22:30 and comes with a glass of house wine. You must go and dine at Lotus if you like Indian food. Be prepared to try something a bit different and be prepared to be blown away. It’s officially my new favourite restaurant and I will be making repeated return visits.